During this lab, we have built a unipolar amplifier, meaning that it accepts only positive voltage. In the ideal world, an amplifier would give an output equivalent of the input in voltage. We still get that in the real world, but the output is not only audio. It has interferences that cause the quality of what has been amplified diminish. This is because the gain decreases when the frequency increases. The higher the frequency, the lower the gain. So before you set up an amplifier, you need to know at which frequency you need you output to be. Than, you set up your gain accordingly. 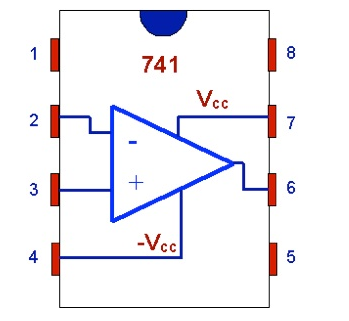 resistance of the feedback / resistance of the resistor connected to negative power = gain. For the lab we used a LM358. This is a dual amplifier, but we used only one. Here is the schematic of the circuit we built.